What can I say? It was incredible. In terms of time, it was my personal best – 15 hours and 58 minutes. Though it rained on us the first few days we were there, the rain broke, and the weather ended up being perfect for race day. My body both held up during the race and recovered incredibly quickly afterwards. And mentally, I felt like myself again. That’s the short version. Here’s a little more detail for those who want it. The water was in the low 60s for the swim. For the first time ever, they did a rolling start instead of a mass start, which means we got started with the race a bit before 7 in the morning and a 100 or so people entered the water at a time in a constant stream. I think the rolling start gave us more space overall, but I still got whacked a time or two. Once in particular, I thought I had a bloody nose from getting hit in the face, but I didn’t. I had a really good swim and got out of the water feeling strong. The bike was tough. It was a two-loop course with very few turns. Much of it takes place on a rolling highway that has some challenging long, gradual climbs. I had a strong first loop. By the second loop, I could feel the hills more, and I had moments of desperately wanting to be off the bike. But by the time I rolled back into town to finish the bike, I felt good again. I felt strong and fast and chipper, which is a good way to finish the bike and get started on the run. My goal for the run had been to run the whole thing. I almost accomplished that. I ran most of the run, but I walked up the one really big hill on the run. Overall, the run was the hardest part for me. About five or six miles into the run, I felt a little off. The folks who had applied my sunscreen for me when I was starting my run told me that my skin felt too cold. I decided to start anyway and to just be aware of my skin and body temperature as I went. There were medics all over the course, so I knew I could find help later if I needed it. Eventually, I could tell something wasn’t quite right with me, but I kept going. I didn’t feel terrible, but I didn’t feel well. Thankfully, I saw my friends out on the run. One of them (Jeanie) even lapped me. She finished the race as I was starting the second loop. I was very proud of her and incredibly jealous. But I started the second loop and got to visit with my mom and my coach for a bit as I did so. Both of them helped me to stay motivated, and I pushed. I pushed myself hard, particularly given that I didn’t feel quite right. The best part of the run was the last seven blocks leading up to the finish. People were cheering and congratulating me. I knew I had a chance of having a finish time that started with a 15, which had been my goal. I could feel the tears coming on. I could hear the folks in the grandstand long before I could see them. I felt proud, and I felt grateful. This was my fourth Ironman finish. Every race is special in its own way, but this race felt personal. I turn 40 this year. It’s been an emotionally challenging first half of the year knowing that I’m aging and that I’m doing so alone. I never expected to be single at 40. I certainly didn’t expect it over the last few years. This year, I have had moments of sadness unlike any that I’ve experienced in the past – moments when I couldn’t see past the sadness – but I kept seeing this race. I knew it was on my calendar. I knew I was committed to doing it with Jeanie and Malinda. And I knew it had the potential to lift me up like nothing else can. It did just that. There is something magical about an Ironman finish line. There’s something magical about deciding to do something challenging and sticking with it day after day, hour after hour, and moment after moment. The intensity, the struggle, the pain, and the thoughts that clutter the mind at the start evaporate at the finish. All that’s left is joy. Pure joy. 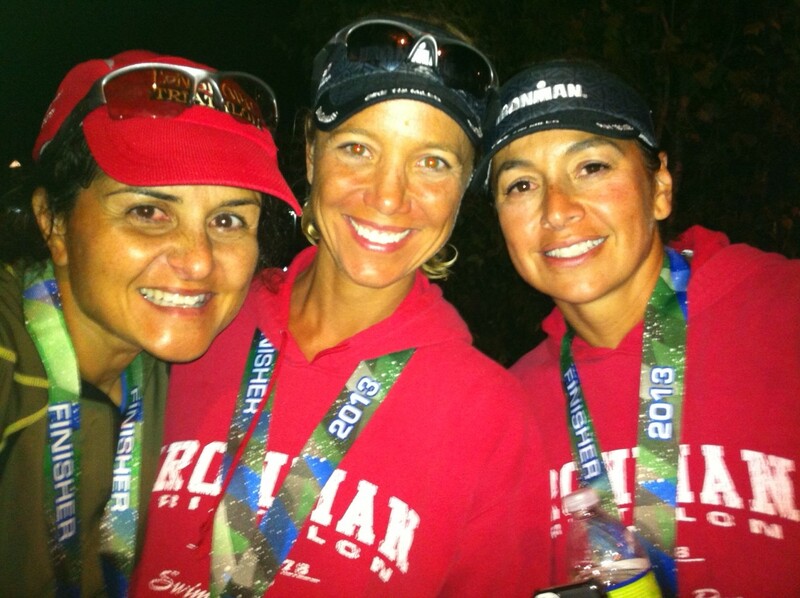 This entry was posted in goal-setting, Gratitude, Hope, Joy, Race Report, Triathlon. Bookmark the permalink. Congratulations on reaching your goal! Thank you for sharing your story once again. You are a strong courageous women making a difference in each person’s life that you meet. Be strong and further on! Thank you, David! I appreciate your encouragement very much. You are the greatest! Congratulations on your monumental success. Thank you, Amit! It did feel monumental. It was a really great week for me. It was nearly perfect! Thoroughly enjoyed your race report. Congratulations on a great race and a PR, Taline! Congratulations on your race!! I’m so nervous with my first ironman in a month’s time in Zurich! Ian, I wish you the best on your race!